Knowledge is really the key in successfully collecting older Pez. Read and learn as much as you can about Pez dispensers. This will provide you with a good foundation for identifying older Pez dispensers and help you develop a sense of value when purchasing both vintage and new Pez dispensers. Currently, there are numerous newspaper and magazine articles, books, newsletters, and internet websites available on Pez collecting. These are all a definite must for anyone interested in Pez, whether they are a beginner or a advanced collector. Even with a considerable knowledge about Pez, finding older Pez dispensers can be tricky. I have tried garage sales, flea markets, antique stores, thrift shops, friends, neighbors and relatives, all with very limited success. A lot depends on luck, being in the right place at the right time. 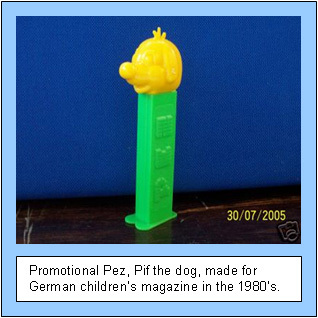 One of the most reliable sources for finding Pez (both old and new) is a Pez convention. I traveled to my first Pez gathering in 1995 and since then have attended both the Cleveland and St. Louis conventions numerous times. Pez conventions offer the collector exposure to many other collectors and dealers who can provide a wealth of information, and also allow the opportunity for purchasing Pez that otherwise would be hard to find. Often when searching for specific Pez dispensers, comparison shopping is an additional advantage when attending the larger Pez conventions. Another good source for locating Pez is through eBay auction sales. This internet auction house has become one of the easiest sources for finding Pez both in terms of variety (old and new) and price (reasonably low to unbelievably high). For me, however, one of the drawbacks with eBay is the fact that you cannot actually see and feel the item you’re bidding for. This makes it difficult to buy with confidence the older vintage Pez, especially if you are fussy, like me, about details such as color and condition of the dispenser. Color variations and subtle differences in appearance or the actual condition of the Pez can sometimes be masked or not at all apparent in the eBay photo(s) used by the seller. You must take the initiative and ask the seller as many questions as you can prior to bidding on an item of interest, otherwise purchasing on ebay can result in a sometimes frustrating if not disappointing experience. On the other hand, there are often many good quality Pez dispensers up for sale on eBay. The ease and convenience with which you can purchase a Pez that you have been dreaming about cannot be beat. Many Pez dispensers that are unique and cannot be found anywhere else have sold on eBay. The internet provides the collector access to a wide variety of web pages devoted to Pez collecting. The Pez Company has their own website and offers, by mail order, all the current Pez dispensers as well as special or limited edition Pez dispensers. Many private websites also offer Pez for sale and are an excellent source for Pez hunting. In addition, there are also web chat pages devoted to Pez collecting which provide the opportunity to easily connect with other Pez collectors. This can be extremely helpful in learning who the reputable Pez dealers are that provide both good products and service. Since Pez dispensers were originally only made in Austria and Germany , and continue to be manufactured in some parts of Europe and Asia, travel outside of the United States can prove to be rewarding in locating some difficult to find Pez. Also, certain Pez dispensers (both vintage and current) were only targeted for distribution in countries other than the U.S.A. , and often cannot be easily or cheaply located here. 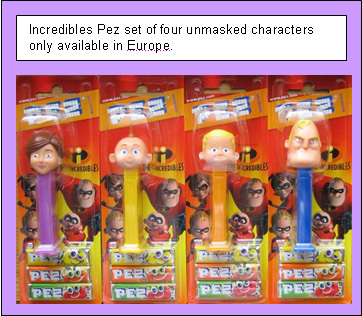 Even travel to Canada can result in finding some of the Pez that are only marketed and sold in Europe or Asia . Finding Pez dispensers in other parts of the world usually has an added bonus in that they will be in different packaging and may come with Pez candy flavors not seen in this country. With knowledge comes wisdom, that expression is also true when it comes to collecting Pez candy dispensers. With a little luck and some patience, Pez collecting is both a rewarding hobby and a good way to spend some time with your kids. Have fun and good luck finding your next treasure. Below are some more resources to help in your Pez collecting adventure. “Pez dispensers joy to kids of all ages”, by Lisa J. Adams, The Detroit News, October 21, 1993 . 1. Cherub for the Valentine series. 2. Pink color variation for the crystal Valentine hearts. 3. Duck and new brown colored rabbit for the Easter series. 4. New Disney set: Dalmation, Aristocat, Rex, and Bambi. May be a Euro release only. 6. Monsters vs. Aliens series, a European release only. 7. Star Wars, Clone series: Captain Rex, Anakin Skywalker, Ahsoka Tano. 8. Phillies baseball may be out in March. 10. Ice Age 3 series: Scrat and Dino Mamma. 11. Thomas and Friends series. 12. New versions of Hulk, Spiderman, Wolverine, and a new Marvels character: Iron Man. 13. New Disney Fairies: Fawn, Rosetta, and Terrance. 14. New Toy Story characters: Woody and Jesse, maybe a new version of Buzz Lightyear. 15. Wizard of OZ set: Dorothy, Tin Man, Lion, Scarcrow, good & evil Witchs, Toto, Wizard. 16. New character to the Disney Princesses series: Princess Tiana. 17. Santa with hauler gift set. 18. New character for the Halloween series: Bat. 19. Winnie the Pooh gift set, with new characters: Winnie Sleuth and Tigger Sleuth. 20. Three new NASCAR sets. 21. New Polar Bear for the Xmas series.